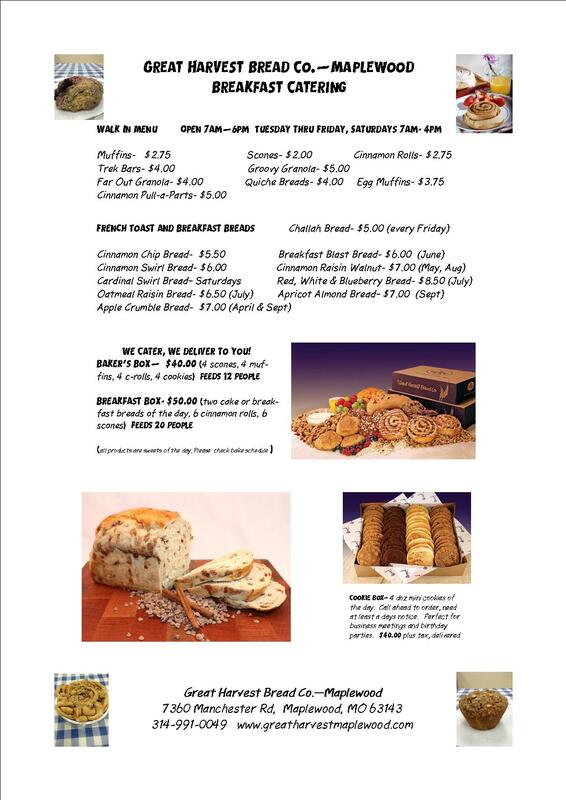 Come in and enjoy fresh baked whole grain muffins, scones, cinnamon rolls, savory rolls and more each morning served with a special cup of La Cosecha coffee. Coffee Bar open 7am to 1pm M-F and 7am to 3pm Saturdays. 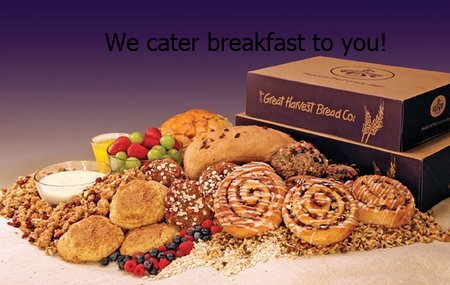 We can also cater your meeting or event with delicious breakfast boxes. We make these whole grain treats everyday.Our cinnamon rolls are cut like pastry flowers and loaded with brown sugar, cinnamon, real butter and vanilla. We bake fresh Quiche breads and egg muffins daily. Quiche breads are made with cheese, egg whites, spinach and sundried tomatoes. Egg Muffins made with cheese, whole eggs, potatoes and bacon. We make them the Great Harvest way, you will not need to dip these in milk or coffee to soften up these tasty treats. We bake 50 or more different varieties throughout the year. 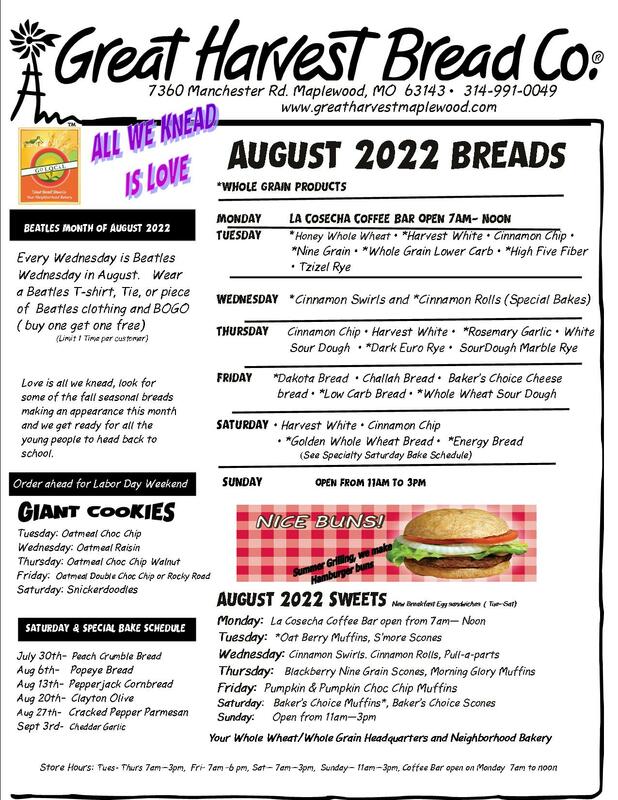 See the bread schedule for this months scones selections. Mary Hanson's favorite is a Banana-Strawberry Scone. Whole grain muffins with our fresh ground whole wheat flour, rolled oats and oatbran filled with different fruits make a healthy breakfast or snack. Check out our muffin of the day. Honey and Peanut butter are the tasty glue that hold oats, cranberries, flax seeds, sesame seeds, wheat bran, oat bran, and millet all together to make a delicious and nutritious cross between a power bar and a granola bar. Double Yum! Pumpkin bread, Raspberry White Choc, Strawberry Shortcake Bread, Blueberry Crunb and Banana Choc Chip are just a few of the tasty quick breads we bake. What is a "Quick Bread or Batter Bread"? We call everything bread at Great Harvest, but its a yeastless bread that has a cake like texture. Triple Yum! Rolled oats, Sunflower seeds, Cranberries, Raisins, Cashews, baked in cinnamon, honey and molasses. Great as cereal, add to yogurt, ice cream or by the handful! 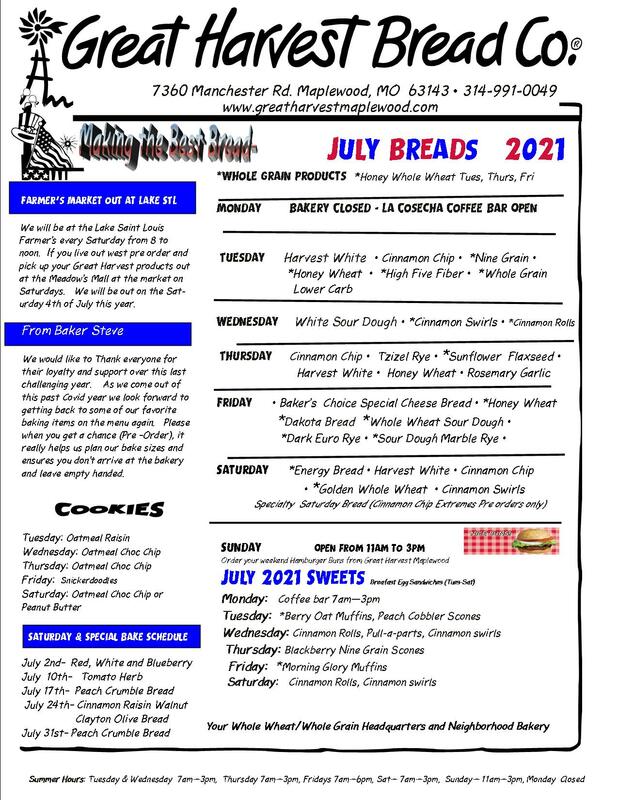 A couple years back the POST DEPATCH rated our Pancake Mix with our fresh ground whole wheat flour as one of the best in town. You can not eat a whole stack of these, but one or two will give you your three servings of whole grains per day. Yum, makes good waffles too!